Jan. 15. UPDATE 915 pm. Duke Power is reporting some 363 customers in Cornelius are without power because of “required equipment maintenance.” Power went off in an area between the Lake Norman Cove at Jetton townhomes, parts of Edinburgh Square and Ramsey Creek Park on Nantz Road soon after 5 pm. 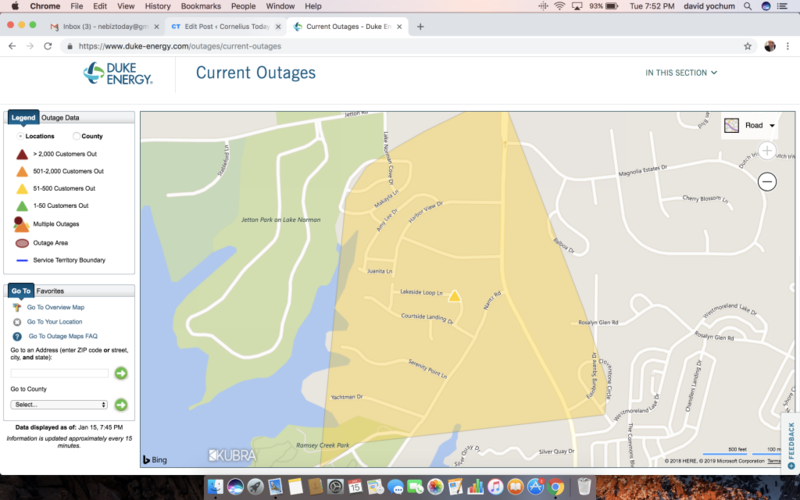 While residents are questioning why maintenance began near the end of the day, this outage is in about the same area as another outage last week caused by an underground cable failure. Power was originally expected to be back on by 8:30 pm; now Duke says 10 pm.